Opening of Trade Houses is one of the important activities carried out within the expansion of the export of Azerbaijani products and promotion of the ‘Made in Azerbaijan’ brand. Established by Azerbaijan’s Ministry of Economy, the trading houses engage in marketing research, participate in exhibitions and implement other activities related to the promotion of Azerbaijani goods. 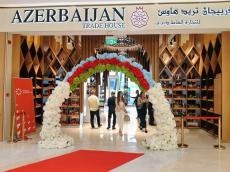 Azerbaijan’s Trade House opened in Dubai on January 15, Trend reports referring to the Azerbaijani Ministry of Economy. A special information office will operate in the Trade House, where anyone can get detailed and interesting information on Azerbaijan, including tourism. The opening of the Trade House in Dubai will provide increase in the exports of the non-oil sector, promote Azerbaijani products and expand bilateral trade. More than 600 products, including fruits and vegetables, dried fruits, nuts, tea, jams, fruit juices, lemonades, canned food, vegetable oil, milk and dairy products, confectionery, makeup products, etc., will be presented in the Trade House. The Azerbaijani delegation headed by Minister of Economy Shahin Mustafayev, as well as UAE officials attended the opening ceremony. Speaking at the event, Mustafayev emphasized that the opening of the Trade House of Azerbaijan in Dubai shows the importance attached by the heads of both states to trade and economic relations, as well as the UAE interest in Azerbaijani products. The Minister noted that relations between Azerbaijan and the United Arab Emirates that are based on mutual respect and friendship, are developing successfully. Mustafayev mentioned that one of the first Azerbaijani trade representatives abroad was established in the UAE, and export missions were sent to Dubai, Abu Dhabi and Sharjah in 2017-2018. Currently, 290 UAE companies are operating in Azerbaijan in industry, construction, trade, agriculture, communication, transport and service. Azerbaijan and the UAE have signed more than 30 documents on various fields of the cooperation, so far. Stressing the development of trade relations between Azerbaijan and the UAE, Mustafayev said that trade turnover between two countries in 11 months of last year increased by 51 percent, exports increased by 31 percent compared to the same period of 2017. He added that Azerbaijan and UAE are also successfully cooperating in investment, since the UAE invested $ 2.1 billion to Azerbaijan and Azerbaijan invested $ 330 million to the UAE. Speaking about tourist flow between countries minister noted that the implementation of "ASAN Visa" system has facilitated the tourist visits to Azerbaijan. Number of tourists from UAE visiting Azerbaijan increased by 13 percent in January-November 2018 compared to last year. Last year, Azerbaijan Tourism Board opened its representative office in the UAE. In turn, UAE Minister of Economy Sultan bin Saeed Al Mansoori underlined that the opening of the Azerbaijan Trade House in Dubai is an important step in the development of bilateral economic relations, emphasized its importance in the economic cooperation and business relations between the two countries and shared his views on expanding mutual economic relations. In addition, the office of the trade mission of Azerbaijan also opened in the UAE. This is the Azerbaijan’s seventh trade house abroad. Azerbaijan opened its first trading house in Minsk in 2017. Azerbaijan has trading houses in Russia, Ukraine, Belarus, Latvia, Poland and China. It is planned to open up to 10 Trade Houses in 2019. According to the Azerbaijani State Customs Committee, the trade turnover between Azerbaijan and the UAE amounted to $48.84 million in January-November 2018, which is 50.8 percent more compared to the previous year. Azerbaijan's exports to the UAE amounted to $19.16 million (an increase of 31 percent), while imports reached $29.68 million (an increase of 67.1 percent). Azerbaijan mainly imports high-tech products, electronics, industrial goods and building materials from the UAE and exports to the UAE fruits, juices, nuts, metal semi-finished products and so on.